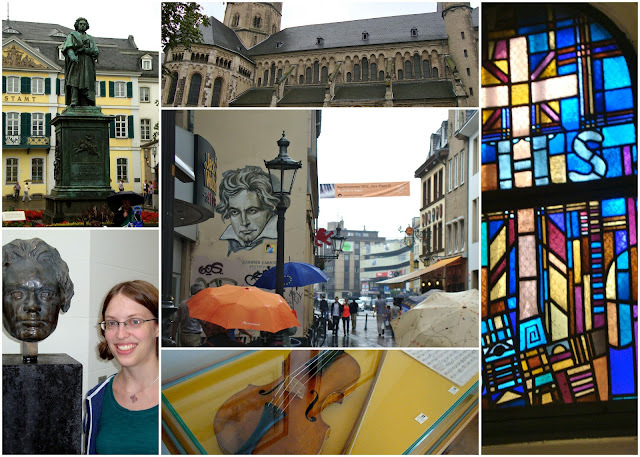 We spent the day in Bonn, mainly visiting so the sister could see Beethovenhaus. It had been a normal day but quickly became unforgettable when an unfortunate event happened to the sister that evening on the way home. She had been looking for the machine to pay for parking in a parking garage. She went up four flights of stairs and ended up in a mall with no parking-pay machine in sight. She headed right back down the stairs, but on the way noticed something wet and vomit-looking covering one flight of stairs. It hadn't been there on the way up because she surely would have noticed it. Just as she thought to herself, "Don't slip on that," she had a hard fall. Into the puke. She still hadn't found the machine to pay for parking, so a little scraped up and vomit-covered she kept walking around until she found one. When she returned to the car and handed me the parking ticket, I noticed it was wet in places. Then the car reeked of vomit. The story gets even better if you trace it backwards and ask some questions. Why didn't you just pay the parking ticket on your way back down to the parking garage? Well, we never actually left this parking garage. I drove into it by accident and there was no way to turn around or leave without going underground and through the garage. How did you accidentally drive into a parking garage? The parking lot near the Chinese restaurant was full, so I continued down the road and planned to take two right turns to go back. The first right turn (that looked like a normal street) soon became a curved descent underground into this parking garage. We had to take a ticket in order to enter, and pay the ticket in order to leave. Hold on, why were you going to a Chinese restaurant in Germany? Heh well, er, we weren't hungry enough (nor in the mood) for a nice sit-down restaurant. After the rain that day, taking Chinese back to our hotel that evening sounded quite appetizing. So there you have it. Our day as summarized by grandma: "Beethoven, Bonn, and barf". 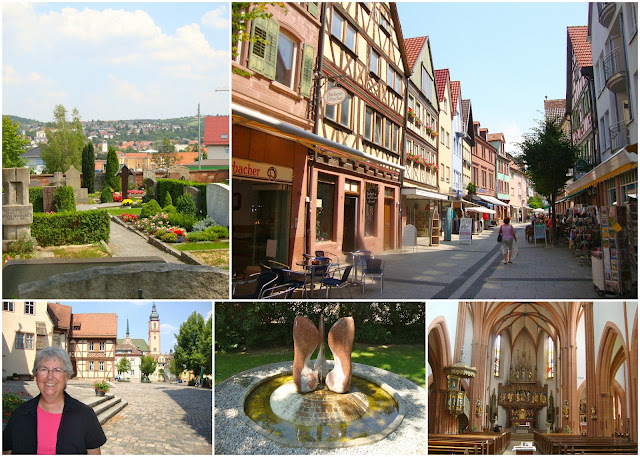 During the second part of our Germany trip we stayed in Baden-Baden, a spa town in the Black Forest. We had perfect weather during our stay: sunny days with cool nights (read: no rain). After breakfast with Michael and Anja we hit the road and I drove to Baden-Baden. 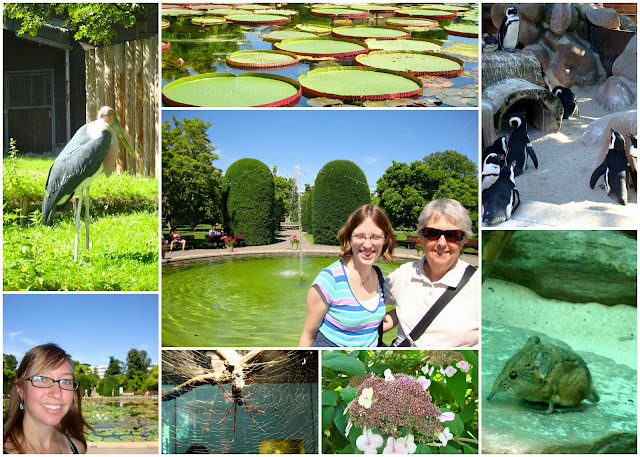 On the way we stopped at Dürnau (Where ancestor Christina Meyer was born in 1839) then later Stuttgart where we visited the city's zoo (as per the sister's request). Highs: Finding a bathroom in the evangelical church when we stopped in the tiny town of Dürnau and I really had to go, buying the second to last available seat on a flight back to Madrid from Dusseldorf at the end of our trip, hearing grandma's pronunciation of "Jagermeister" at the hotel bar. Lows: Arriving to Dürnau's townhall at 12.40 to find that on Mondays it closes at 12.30. We called today our "spa day" and stayed within Baden-Baden, exploring the town. Highs: Getting a free third hour at the spa thanks to a summer deal, sweating in the aroma-sauna room at the spa, buying a vegan gluten-free lactose-free rice milk chocolate bar at a health foods shop, the sister getting two job offers in one day, the nice lady at the hotel letting us print that night after the other hotel lady said no that morning. Lows: A fly flying around in our sugar bowl at breakfast, the sister and grandma having to pay 6 euros each to use a towel at the spa when they could have brought one from the hotel (I brought my travel towel along), getting charged 7.50 euros for a 1L bottle of water at lunch. 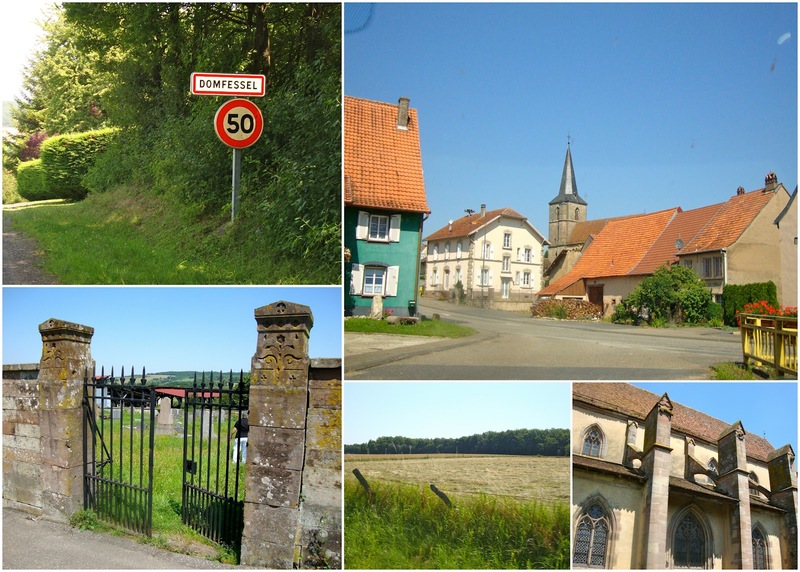 On Wednesday the sister drove us to the small town Domfessel, France because we have an ancestor whose passport was issued there in 1785. After visiting the two cemeteries and meeting a woman from town we drove to the next closest town that actually had a restaurant. Lows: The shower curtain falling while grandma was showering in the morning, my wristbands making grandma's wrists smell like pee because they'd gotten wet in Madrid and have been in a hot airtight case ever since, only finding two kebab places to choose between for lunch in France, the sister driving past multiple barricades and getting halfway through a tunnel under construction before being stopped by construction workers and told in German that cars couldn't be here. 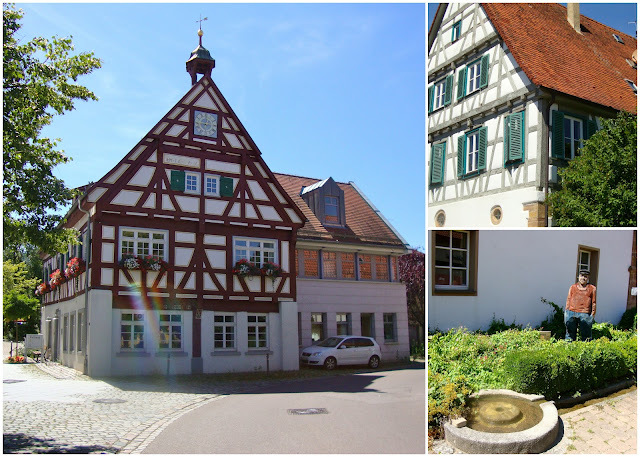 Today I drove two hours to Tauberbischofsheim where we saw the town center before heading to the cemetery. Afterwards I drove another hour to Heidelberg to visit the castle ruins. 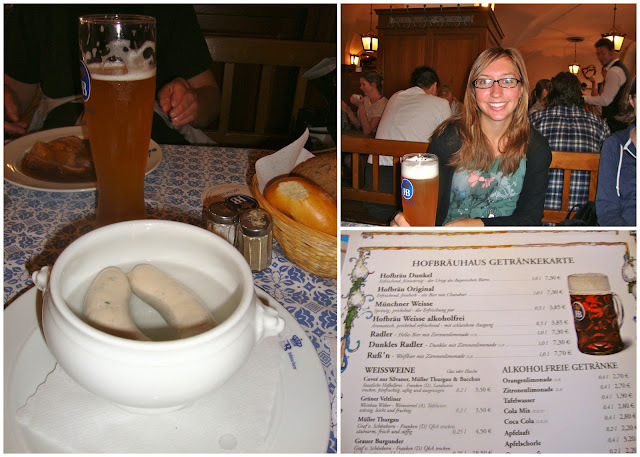 We had our first post-breakfast meal at 19.30 on the way back to Baden-Baden. 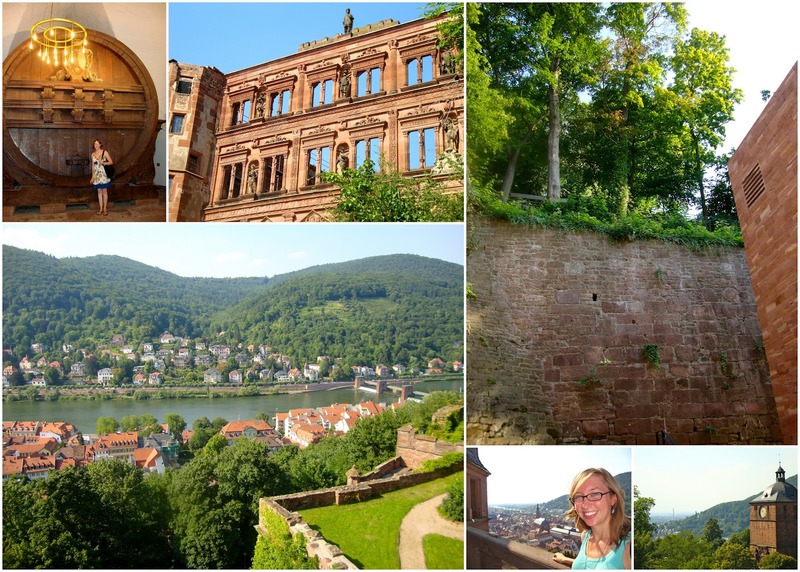 Highs: Remembering to put diesel in our diesel-only rental car, driving fast on Germany's highways with no speed limit, getting to the Heidelberg castle an hour and a half before it closed, bringing back wine from Tauberbischofsheim to our hotel room. Lows: Waking up super early, lady working in the Tauberbischofsheim tourist office telling us, "Do you need me to do something or can I get back to my work? ", driving in Heidelberg, the GPS leading us down a pedestrian/bike only street where I had to stop and turn around in a tight spot with many obstacles (fountain, parked motorcycle, bicyclists, benches, restaurant terraces, etc.) in front of an audience composed of four restaurant terraces in another small town- Walldorf, eating at an Italian restaurant for the third time during the trip, buying a wine opener for the two smaller bottles we got today then finding out tonight that they're twist-offs. For those of you unaware, last Friday I left for Munich with my sister and grandma for two weeks in Germany. The main purpose of our Germany trip is to visit little towns where we have ancestors, since after years of family tree research my sister has traced us back to the 1700's here. 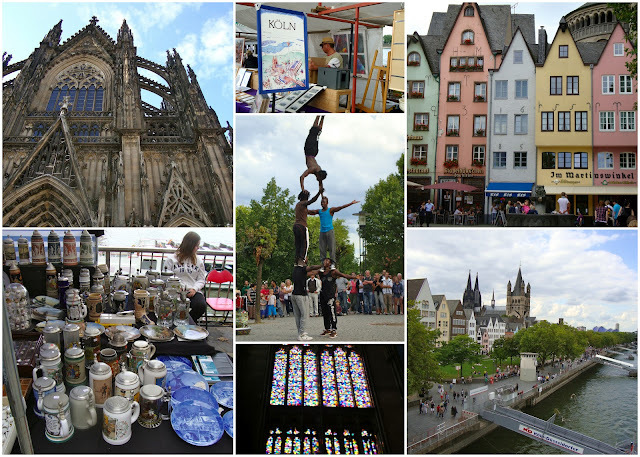 The first quarter of our Germany trip has already come and gone. 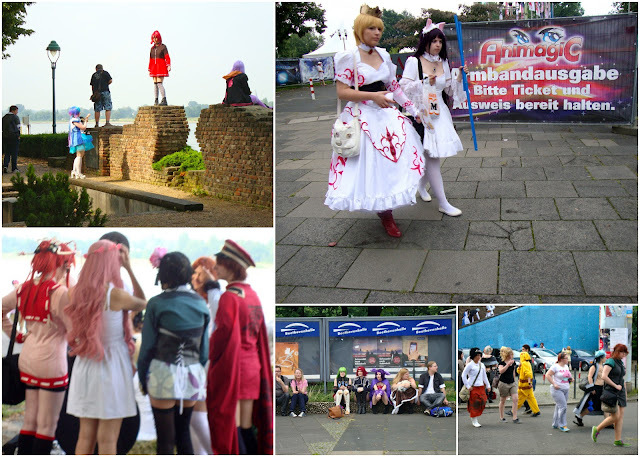 A brief summary follows, updated with pictures. 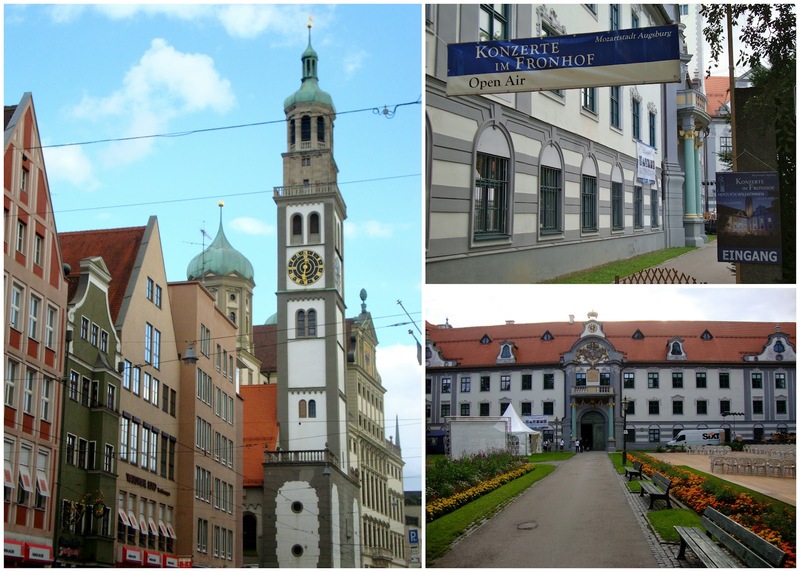 We flew to Munich, picked up our rental car, ate at Hofbrauhaus, then drove to Königsbrunn where we'd be staying in a hotel for the next 3 nights while visiting friends of my grandma. Highs: Saved over 100 euros when the rental car lady waived the fee to add me (an under 25 driver) to the list of drivers, getting a nice Opal as our rental, arriving just on time to see the glockenspiel go off for 10 minutes at 17.00. Lows: Leaving our umbrellas in the car while we walked around Munich only to discover it was raining by the time we finished lunch, being cold and wet. 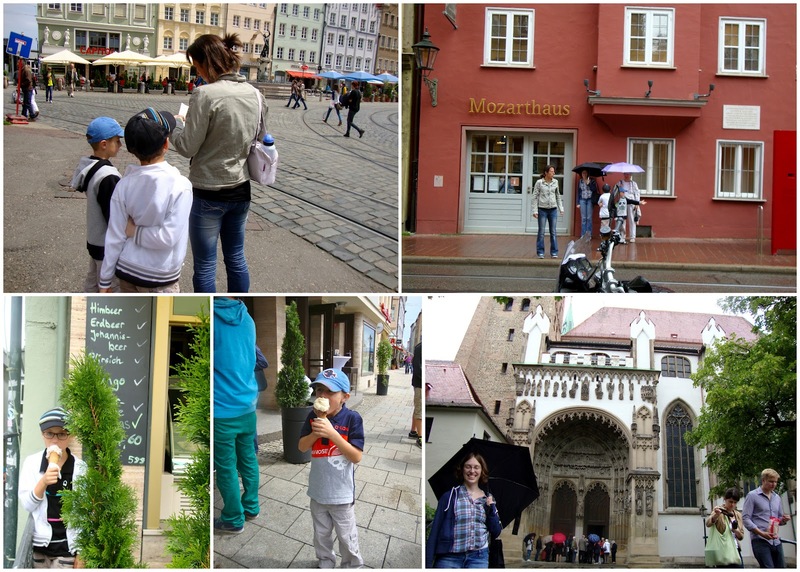 We met Anja and her sons Manuel and Julian (6 and 8), then took a bus to Augsburg with them. That night back in Königsbrunn we had dinner with Michael and family at an Italian restaurant. Highs: Hotel breakfast, the Polish guy we met at breakfast telling us our accent was very clear and understandable (yay Wisconsin), seeing Mozart's father's house (says the sister), snacking on a pretzel with butter and chives, learning basic German words from an 8-year-old at the Roman museum, the sister planking on a Roman bath in the rain, 6-year-old Manuel saying to Anja about us (in German), "Mom, when they talk all I hear is 'bla bla bla!'". Lows: The sister leaving her umbrella on the bus, accidentally keeping Michael up late at the Italian restaurant due to an ESL miscommunication (we thought he was waiting for his card or change back after paying the bill but he actually had been ready to go for quite some time). We went to a children's mass for Manuel's class in the morning, then took a taxi to Augsburg for the sister and grandma to attend a violin recital that was part of Mozart Fest. Highs: Eating yummy baked goods at a bake sale after mass (those kinds of desserts don't really exist in Spain), Manuel and Julian making us each a drawing, the sister and grandma getting better seats at the concert than people who had bought tickets in advance, drinking apple juice that was 55% fruit. Lows: Not knowing where to buy tickets for the concert, not speaking German, being ignored by the security woman on the concert grounds, being terrible at frisbee on the Wii at Michael and Anja's house. We had breakfast with Michael and Anja at 9 o'clock before leaving Königsbrunn and beginning the next leg of our trip. You can do a lot in a day. On Wednesday, we took our time getting ready in the morning. I walked to McD's with grandma for a coffee, then picked up some pastries for breakfast from a nearby pastelería. El Escorial lies 45 km northwest of Madrid and used to be where the King of Spain resided. It has since functioned as a monastery, school, museum, and royal palace. Grandma said she thinks it's the biggest building she's ever seen. In 1559 Philip II appointed an architect to design El Escorial, and it was finished in 1584. After leaving El Escorial we went to the nearby Valle de los Caídos, which I've never visited before. Here's some good information about the site. Briefly, it is a Catholic basilica where many who died during the Spanish Civil War are buried. There's lots of controversy surrounding the memorial because it was dictator Francisco Franco's idea to build it, using prisoners of war to do so. Franco is also buried in the basilica, making it a place that not many Spaniards want to visit. Heh... Just having fun with each other's company--and the camera! We stopped for lunch, then drove to our next destination: La Granja. We paid to visit the inside of the Royal Palace of La Granja de San Ildefonso. This was where the Kings of Spain lived during the summers, since King Philip V. Grandma liked seeing the 50-year-old tapestries inside, while I preferred the gardens. Since we were so close, we drove to Segovia that night so Jacki and grandma could see the Roman aqueduct and the palace. After about a two hour drive, we all went straight to bed when we got home that night. Tapas; for supper we had lots of seafood plus beer with lemon. The next day I asked Gregorio what we had eaten, and this is the list he came up with: sole, whiting, dogfish, tuna, salmon, anchovies, herring, shark, prawn, squid. Some of the fish were served to look like they were eating their tails. And that's all from Day 1. I got to use my Spanish on the plane. I asked for agua, vino blanco, pollo, and té. Rebecca was impressed with the amount of Spanish I remembered from high school. I was able to talk with Gregorio and understand some of what he and Rebecca were talking about. Grandma and I were super tired all day. We walked around downtown Madrid and had tapas and sangria. That was supposed to just be a snack before lunch, but we were both falling asleep so it turned out to be our lunch and we returned to Rebecca's apartment and napped for a while. Grandma was still sleeping when Rebecca and I got up so she and I went out to Retiro Park, which Grandma had seen with Mom when they were in Madrid over New Year's. Gregorio and Grandma picked us up from Retiro Park and then we went out for a late supper (well, I guess normal for Spain...it was 10 I think when we got there). We slept well that night. Monday was Gregorio's 46th birthday. He was gone working his usual night shift on Sunday night, so I made and left out a chocolate cake that he would see when he got home Monday morning. Har har har. What a jokester. That night -- the night before my sister and grandma arrived in Madrid -- Alex, Gregorio, and I went to dinner at the Japanese restaurant we always go to near his apartment. This time we sat around the table where they cook in front of you, which Gregorio's wanted to do all year. It was fun to watch; he'd even toss and spin the pepper shaker any time he used it. Everything was a performance. And everything was delicious. When we were done eating I tried to pay for Gregorio's third of the bill, forgetting about the Spanish tradition I don't think I'll ever get used to: On your birthday, you pay. If you invite your friends out to dinner with you, you'll be taking care of the bill. Heading to a bar? You'll be buying some rounds. But as an American, it's so engrained in me that on your birthday others should treat you. So yes, Gregorio paid the bill for all three of us on his birthday. And although that's very normal for Spain, I think birthday celebrations of my Spanish friends will always feel a bit weird to me.